Thanks for letting us know about those great new additions to the Mobile Apps book! I can post a link or update when they are available. I did leave my docent workshop on iPads with one question (I’d be interested in your thoughts). One docent was stunned by the color and detail that could be shown on the iPad screen, but then noticed that the artworks on the walls around us (in a particularly dull-colored gallery) paled in comparison to the light-emanating screen. Have you ever encountered any similar concerns about the ‘visual impact’ of the iPad (especially the new iPad 3 and its retina display with 3.1 million pixels) versus the visual impact of the artworks themselves. I hope I’m making sense here — it was a complicated issue that this particular docent brought up, and I thought she had an interesting point. I’m not sure it detracts from the museum experience, but I wonder if it might leave some visitors wanting more from the paintings … visually. Kris – will users who downloaded the digital version of the book receive an update on the additional material? I just put out a blog post about how the Art Institute of Chicago is using iPads for educational programming. I also showed the Gerhard Richter painting technique video you highlighted before going to our Richter Galleries to paint on iPads. Great to hear more about the trends and current uses elsewhere. Would enjoy making further connections with anyone interested in collaboration. AIC – excellent post on your blog. Thanks for sharing it here! I would love to know the name of the painting app you found worked the best. I hope to experiment more with “art-making” on the iPad, and I have used the app called Paper for some simple (but good) drawing activities. I attended a session at NAEA this year in New York in which David Stark presented ways he uses the iPad and mobile phones in his teaching. The session was called “Please Turn Your Cell Phones On,” and it totally inspired me to invite students to use their cell phones in various ways during my tours and museum programs. We haven’t done any iPad programs yet — where students or visitors are provided with their own iPads. But that sounds very interesting. I know that many museums are providing iPads to visitors for additional interpretive materials and self-guided tours. Thanks so much for sharing your experiences here. I’m wondering, have you come across articles, resources or examples that specifically highlight the use of iPad technology in history museums or historic sites? Appreciate your thoughts and suggestions! When I attended the 2011 National Docent Symposium in St. Louis (where I met you, Mike!) I encountered the use of iPads for the first time at the Kemper Art Museum. The college docent leading the tour used the iPad to discuss a contemporary work’s reference to Jan van Eyck’s Arnolfini Portrait. After exploring the work in front of us, she opened the van Eyck on the iPad and zoomed in on the mirror. I found this a successful way to deepening our understanding, while not detracting from our experience with the contemporary piece. I frequently struggle with the use of visual aids with my docents. I ask that they all be approved by staff, but I know there are many “renegade” objects and illustrations out there (usually of poor quality, but thoughtful and well-meaning intent.) I agree that the use of visual aids (technological or otherwise) should be limited, and never distract from the experience with the object. I wonder if offering iPads with pre-selected images and videos would be a way to maintain consistency — as well as the chance to training docents on the best ways to use the specific visual aids? Becky — thanks for your comment! Great to reconnect. While I have moved from my position working more directly with the docents at the Saint Louis Art Museum (I’m now Director of Education at the Portland Art Museum), I can tell you that I always found it productive to keep docent use of iPads rather open — not giving them “approved” pre-loaded, prescribed content on iPads, but rather clearly training them on best practices, great ways to use iPads on tours, and providing lots of examples of good content and good usage. Then the docents could explore using the iPads on their own, and often come up with even better ways to use them. My post above discusses the “sample tour” I gave docents in an optional workshop I offered to them. After that workshop, docents were bringing in music on their iPads, images that I didn’t know existed (and were great), and using apps that I was not familiar with. They were experimenting, and we were all learning together. But that is just the way I prefer things — more open, and less structured. I know that other museums, however, have successfully used iPads preloaded with specific “approved” content geared toward certain tours and collection areas. Good luck with bringing iPads into the galleries. 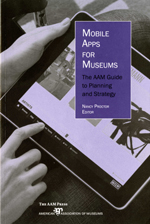 It is a fantastic device for museum education, and I know that we, as educators, are only barely scratching the surface. Cheers! Mike, I was delighted to discover this post — albeit a year old — and your wonderful blog and all the links you and your followers provide. Regards also to Kris Wetterlund, who helped me and my colleagues at the Dalton School (NYC) learn how to use Artstor. Kris, you continue to inspire my ongoing efforts to find innovative ways to scaffold the methods and questions of art history (aka visual cultural studies) and museum education into the K-12 academic curriculum; as well as my ongoing personal quest for a niche for myself, where I can integrate my current work in K-12 teaching, museum education, and pedagogy with my Ph.D. in art history and previous experience in college teaching, curatorial work, and academic scholarship. So, thank you both for opening my eyes. As the Resident Art Historian/Museum Liaison at Dalton, I have spent much of the past few years collaborating with colleagues to integrate iPads into the K-12 Museum Program. We have had good experiences on two fronts: teacher with IPad; students with iPads. 1. Like Mike, we are using iPads in museum settings as a platform on which to showcase related video clips, music, primary text sources and images, including maps — to help students bring meaning to artifacts of visual culture. Again, like Mike, a short video clip of a plank-mask festival in Burkina Faso helps first-graders envision the context in which similar masks at the Met would have been worn. The video also encourages students to move their bodies in sync with the music, while imagining themselves wearing one of the masks on display; as well as facilitating a discussion about the relationship between the rhythm of the music, the size/weight of the masks, the spinning motion of the body, and the visual affect of concentric circles and checkerboard patterns spinning with the mask, the music, and the performer. Similarly, I like to show fifth graders an artifact on display at the Met, alongside a field photo of the same artifact on an iPad. The goal is to highlight the vital way archaeological context informs our understanding of the original use and meaning of an ancient artifact. For example, I might show students a small standing male statue with hands clasped in a case in the Mesopotamian Galleries, alongside an excavation photo showing its discovery in a hoard with similar statues below the floor of a temple in southern Iraq, ca. 2800 BCE. Fragments of similar statues, also found re-used in later temple contexts, raise the issue of the secondary life of objects. Examples of re-cycled objects from the modern era bring these esoteric artifacts to life for young students. I love the ease with which an iPad lets me integrate supplementary materials into a museum lesson, Nevertheless, I still struggle with visibility issues — with its small screen and back-lighting — occasionally resolved by placing an extra iPad or two in the hands of chaperones. I also find it a little too easy sometimes to slip into a passive-style, old-fashioned slide lecture — albeit without the glorious scale of slides. 2. To insure a student-centered, interactive experience, we have started bringing an enough Pads for every student. Fortunately, we have the necessary resources to do so; and the flexibility to custom-design each visit to accommodate the curriculum and the goals of the classroom teacher; the state of the technology; the grade level; and skill set of the students, including their familiarity with tools and questions of visual studies, as scaffolded into a cross-divisional visual studies sequence. For example, the third grade social studies curriculum on the Age of Exploration includes an archaeology component. After their excavation, each student chooses one artifact to analyze for the purposes of a final archaeological report. For the sake of determining a possible date and place of manufacture of their artifact, we ask each student to find a comparative object or image at the museum. The students will have already uploaded a digital photo of their excavated artifact onto a worksheet specifically formatted for an annotated side-by-side comparison. In this context, the iPads consistently boost the students’ motivation to embed their artifacts in their proper archaeological and historical context; and to pull as much information as possible from the available visual evidence. While student use of iPads at the museum has been very successful, it requires quite a bit of effort beforehand by the students, classroom teachers, technologists, other specialists, and myself. More difficult to assess is the degree to which it enhances or detracts from the museum experience. Without adequate practice — especially with the sketching app and the nature of the assignment — some students seem to spend more time with the technology and less time looking at and thinking critically about the art. The ability to take photographs adds an extra level of motivation for the students — at the same time requiring extra time in class to review student observations and inferences. In the end, the teachers and students all like having a digital record of the museum visit for the sake of ongoing student research. At this early stage of the game, I would relish sharing experiences with other teachers and museum educators. I look forward to making my way through this large body of online literature and ideas. At the Art Institute of Chicago, there are screens (iPad or tablet, not sure) next to many of the paintings and sculptures so that musuem visitors can learn more about the work, the artist, the genre, and so forth.